1. 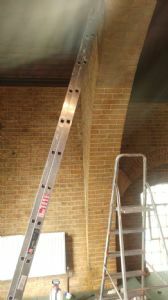 Cleaning the brickwork, the wooden ceiling and beams. 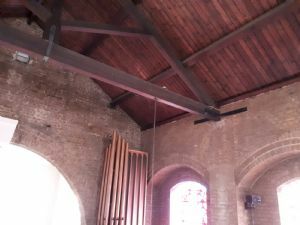 In mid June 2018, work commenced on cleaning the church's wooden ceiling, wooden beams and washing the exposed brick work – this work has now started in earnest the brickwork above the gallery is being cleaned and you can see for yourselves the difference it has already made. 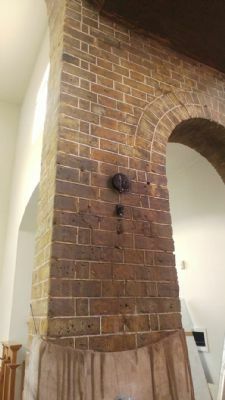 This is an arduous task as the brick surface is carefully handwashed, (the brick surface is washed at least three times first with sugar soap, followed by second wash with a light washing up solution and a final third wash using a mild salt solution) to remove the accumulated dust and stains from candle smoke that had accumulated over the years. 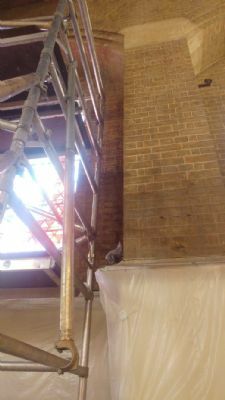 Care is being taken to ensure that both the original lime wash details on the brick wall are preserved and the integrity of the exposed brick surface is not compromised. Thus, the process is slow and requires hard physical work during daylight hours. 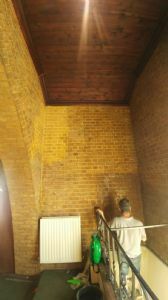 The aim is to clean the entire brickwork inside the church and at the same time, clean all the exposed wooden timberwork and the wooden ceiling. 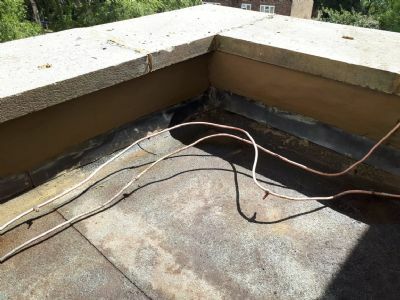 While the refurbishment programme commenced in mid-June 2018, as we now enter early July 2018, we can all start to see the progress that is being made. 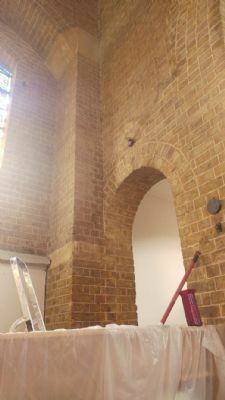 Though there is still much more work to do, parts of the interior brickwork that has been cleaned has taken on a new appearance, this is a testament to the hard work being carried out daily. 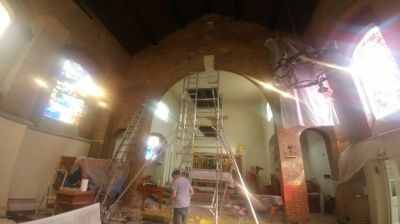 It is an exciting time for the parish, as the interior of the church are refreshed. 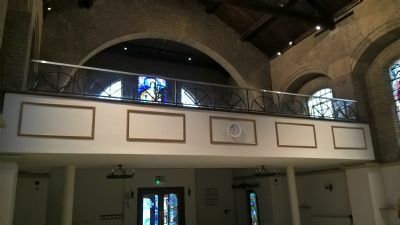 The photographs left and below illustrate the progress that is being made and whenever one enters the church, it is a delight to see the daily transformation taking place inside our church. 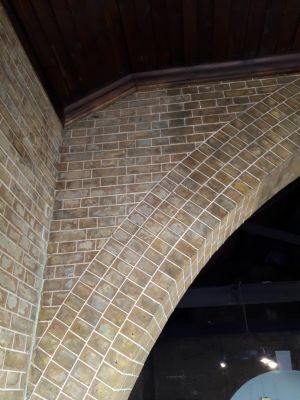 It is getting harder to remember how dark the interior space was before the cleaning commenced, as the brickwork hue was then shaded to an almost brown / black patina or colour in appearance. 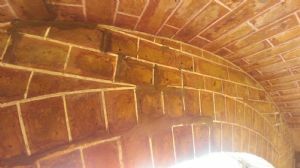 As of 6th July 2018, Marc Bernard and his colleague Louie Silverman have almost finished cleaning the interior brick work. The work to clean the wooden beams and the wooden ceiling continues. This is a painstaking task as it involves both hand-washing the ceiling and beams and also hoovering the horizontal planes of the beams of accumulated dust, this is a slow painstaking process and the recent heatwave has made this job more difficult as the hot air rises and the roof space where the cleaning takes place gets very hot and humid. 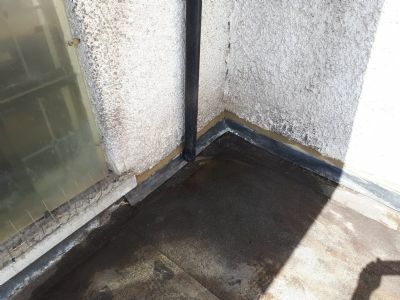 Additionally, the scaffolding tower had to be set up every morning and partially dismantled at the end of each working day this added a total of around sixty to ninety minutes of extra work before any actual cleaning could commence. It has taken almost two months, for this element of the project to near completion. 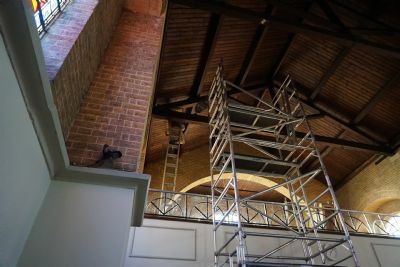 The refurbishment, restoration and renovation of the interior aspects of the church started in mid June 2018 and now in early August 2018, the cleaning of the brickwork and the wooden ceiling and beams is nearly completed. 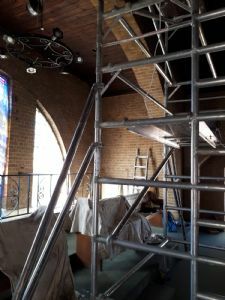 Work has now comenced on re-painting the interior spaces of the church, this includes the High Altar area, the walls surrounding the main body of the church and the gallery wall and architraves or mouldings. 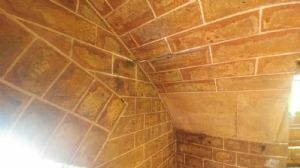 The photographs below illustrate the washing and cleaning, a three stage process, that the brickwork underwent. 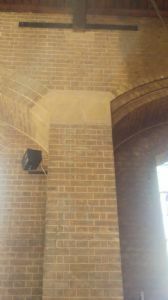 These photographs show the arches on either side of the high altar. during the cleaning process. Washing the brickwork was an ardous task consuming many hours of hard work. The tuckpointing on the brick face can be better evidenced on the now cleaned brickface see the photograph below. 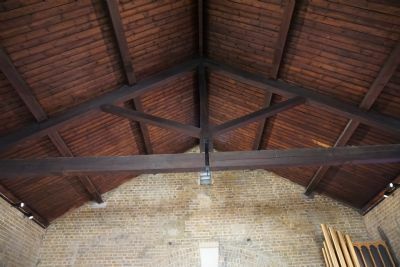 Cleaning the timber beams and wooden ceiling. Another ardous task made more challenging by the hot weather and high humidity. 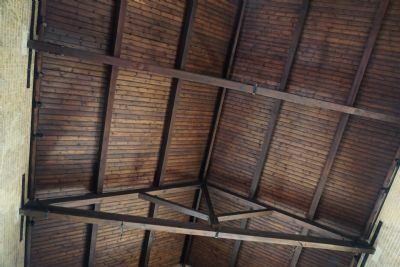 The temperatures in upper spaces of the church were akin to that of a sauna. 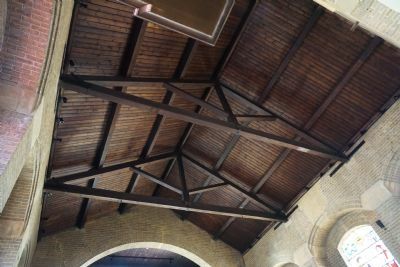 As at end of July and early August 2018 the photographs below show the difference the deep clean has made to thebeams and ceiling of the church. 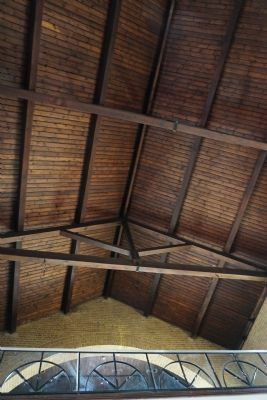 The beauty of the cleaned timber adds a new dimension and look to the church. 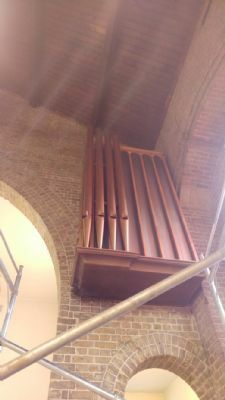 The organ speaker box and pipes were also treated to a complete clean. 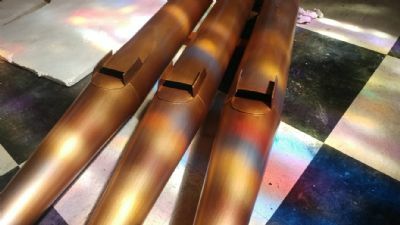 The following photographs illustrate the various stages of cleaning the organ pies and the spearker box, from removal of the cosmetic pipes, their cleaning and repainting returning them to their former shiny glorious look. Before cleaning the organ pipes had a dull patina and the wooden speaker box was dusty and wood darkened by dust and candle smoke. 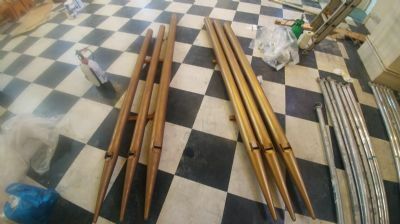 To restore and clean the organ pipes they had to be dismantled and removed housing or cabinet that enclose the speakers. 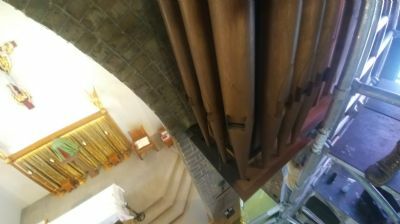 The difference once the organ pipes were cleaned can be seen in the photograph below. 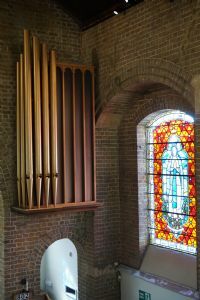 The speaker hoising or cabinet cleaned and organ pipes re-assembled. 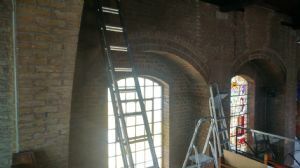 The stained glass windows have also been cleaned and the together with the surrounding cleaned brickwork enhances an area of the church that was previously dark and covered in dust and candle smoke. 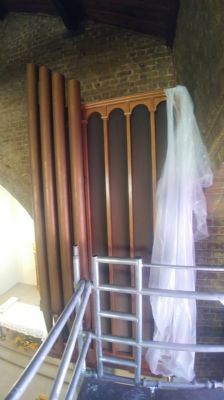 The newly cleaned and restored organ speaker housing and repainted organ pipes are presented in these photographs. During heavy rainfall leaks had started to show on both of the side altars. 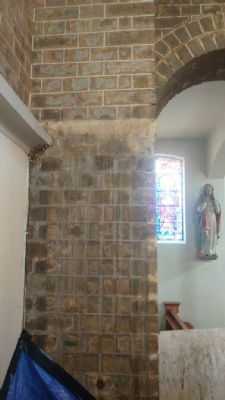 The location of these water damaged patches appeared where the side walls met the ceiling, sited to the rear of the side altars. 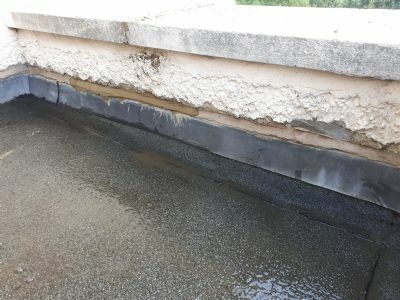 Remediation work has been undertaken on the flat roofs above where the leaking originated. 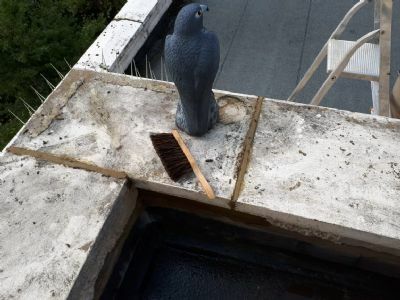 Work started to clean away lose mortar, renew the lead flashings, and make good the bitumen roofing material. 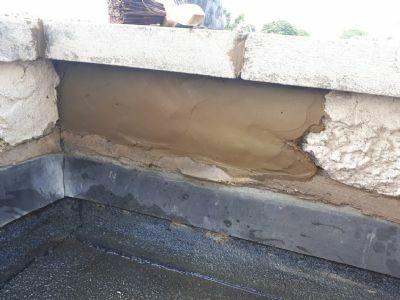 Threafter the repaired sections of wass was re-mortared over new lead flashings and the coping stones along the parapet wall was also fixed and lose motar joints made sound. 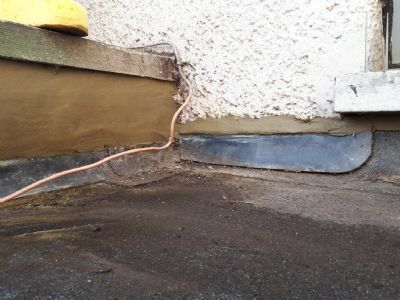 The damaged flat roof and the repairs required to make good the leaking roof can be seen below. Hopefully these repairs mean that the leaks will cease, time and another prolonged heavy downpour will tell. 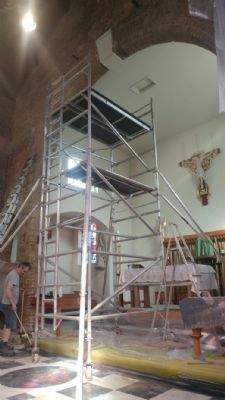 Repainting the high altar and sanctury rear and side walls commenced, towards the last week of July 2018. The high altar rear and side walls were washed down with sugar soap, and the surfaces made good prior to any repainting. The windows on either side of the high altar have also been cleaned at the same time, the red and yellow stained glass is now visible. The entire high altar area and church appears brighter now that the majority of the surfaces have been cleaned The addition of the new light fittings increases the illumination when the lights are turned on making the whole church appear both brighter and confer increased space. The gallery balcony has now been cleaned and repainted and the architrave mouldings painted in a shade of gold to better contrast with the lighter surounding paintwork. To enhance and highlight the internal walls and woodwork, the interior fabric of the church has been carefully painted and shaded with subtle paintwork and consider colour scheme, that is in keeping with the building.